This library contains multi-sampled water bell samples borrowed from my sound library Resurrection for Alchemy 2, various different sized Nepalese bells dipped into a bathtub after the initial accent, sampled with up to 8x round robin. A singing bowl also dipped into the water after hitting it with a wooden beater, various processed waterbell textures and ambient soundscapes derived from those bell samples, two wavetable patches using wavetables extracted from the samples and a few original soundscape samples produced for this library. Up to 25+ Macros and switches are assigned in each patch, most presets make use of the modulation wheel, many patches also use aftertouch and modulation via velocity, providing detailed control over volume envelopes, filtering, amplitude- and pitch modulations, dynamics, EQ, stereo animation and more. All patches use some sort of background image in the UI. All water bell samples were produced at a resolution of 48Khz/24 Bit/stereo/wav – recorded in L-C-R with 3 Neumann microphones, all signals are phase-aligned. You can view/download the PDF for this library with more details, the licence agreement, and the patchlist including descriptions and playing tips here. *290.1 MB of samples (47 wavs/stereo/48 Khz/24 Bit), 5 background images for the UI, 2 impulse responses for the convolution reverb, 2 wavetables. *19 patches combining many synthesis forms available in Falcon. *The content is not encrypted, so you can use the samples and wavetables in other samplers and synths or directly in your DAW. *Price: € 18.50 EUR (50% discount for license holders of Resurrection for Alchemy 2). 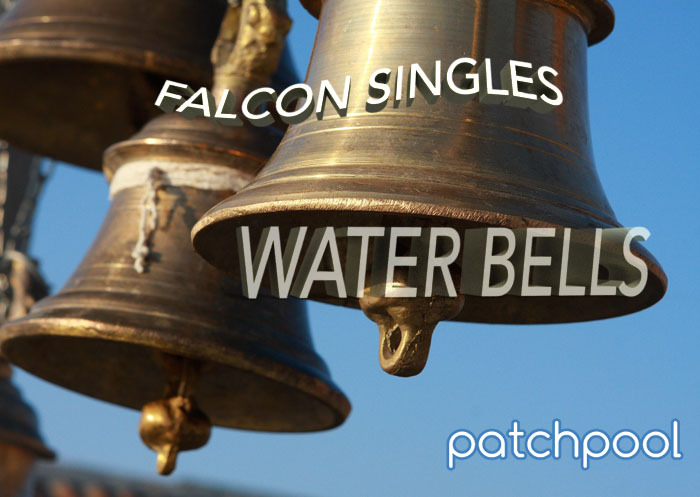 The demos below were produced using only patches from Falcon Singles – Water Bells, no post-processing was applied apart from a limiter on the master output.